Central Universities Common Entrance Test (CUCET) is a national level entrance test that is organized jointly by the ten central universities together. The ten universities are: Central University of Haryana, South Bihar, Jharkhand, Karnataka, Jammu, Kerala, Punjab, Kashmir, Rajasthan and Tamil Nadu. This test is conducted for admission into the UG/Integrated Programme, Post Graduate Programme and Research Programme in various educational and professional field respectively in these ten Central Universities. The examination commences once in a year in the month of June. 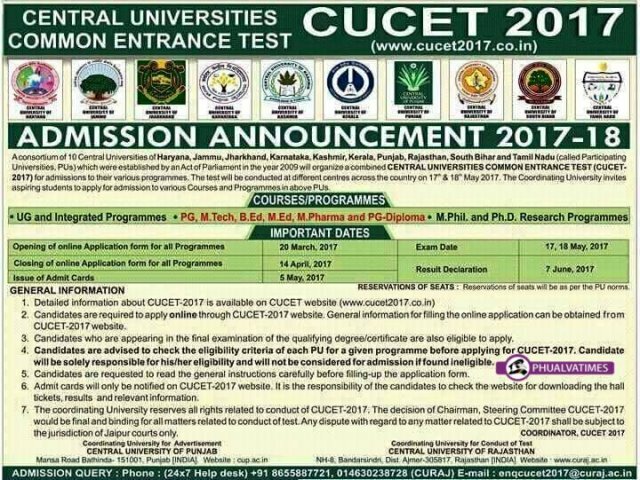 Here, we are providing the detailed information about CUCET 2017 including application form, exam dates, eligibility and syllabus. The application form is available only through online process from the official site. There is no provision for offline application form. The CUCET 2017 Application Form is available from the 20th March 2017. The last date to submit the application form will be the 14th April 2017. Candidates can pay the fee through online or offline mode. After the submission of the online application form with online payment an automated e-mail and SMS will be sent to the candidate maid ID & mobile number. Those candidates made payment through Challan they have to wait for 7 days after submission of the form. Candidates can apply for a particular course for a maximum of the three PUs (Participating Universities) with a maximum of three options of programmes in each of the selected PU.